Baked Macaroni And Cheese recipe by swtmanoo at PakiRecipes.com. Cook macaroni in salted rapidly boiling water drain and keep aside. Heat olive oil in a vessel, add the onions, capsicum and crushed garlic and saute till transparent. Add the chopped tomato and salt . Cook for 8-10 minutes, stirring once in a while. Add the boiled corn and combine. While the onion -tomato base cooks, prepare the white sauce. Heat a pan, on low flame, add the butter and let it melt. Add maida and keep stirring using a hand whisk over a low flame till well blended. Slowly add the milk, stirring continuously. Next add the grated cheese. Once in a while, remove the vessel away from the heat for a few seconds and place it back while stirring. Season with salt and pepper. Next add the boiled macaroni to the cooked onion -tomato base and toss for 2-3 minutes stirring well to coat. Adjust salt , season with freshly ground pepper, mustard powder and sprinkle some grated cheese. 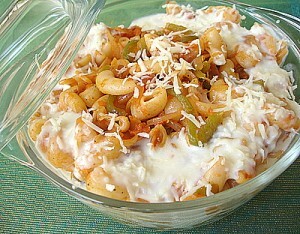 Turn off heat.Remove macaroni onto a baking dish and spoon the prepared white sauce along the edges of the dish. Bake in a pre-heated oven at 200 degrees C for 10 mintes.